This is a very old and traditional Italian recipe, and also "peasant food" of the finest kind; It was made in the past during the fall and winter by those too poor to be able to afford wheat flour. Chestnut flour is, in fact, quite tasty, and its association with poverty has by now vanished completely. In other words: this is an elegant and nutritious autumn alternative to regular pasta. In this recipe, chestnut flour is mixed with wheat flour to form a dough for fresh pasta, which is either cut into irregular shapes (stracci), or long, narrow, flat noodles (tagliatelle). The pasta is served in a very simple sauce of melted butter flavored with a fresh sage leaf, to allow the nutty, earthy chestnut flavor to shine through. You can also add a dusting of freshly grated Parmigiano-Reggiano cheese when serving (optional). Form them into a mound on a wooden surface. Scoop a well in the mound to form a volcano-like shape and crack the eggs into the crater, together with the olive oil and a pinch of salt. Knead the dough for 10-15 minutes or until it is firm and elastic (see instructions for making fresh pasta dough). Roll the dough out to about the thickness of a dime. 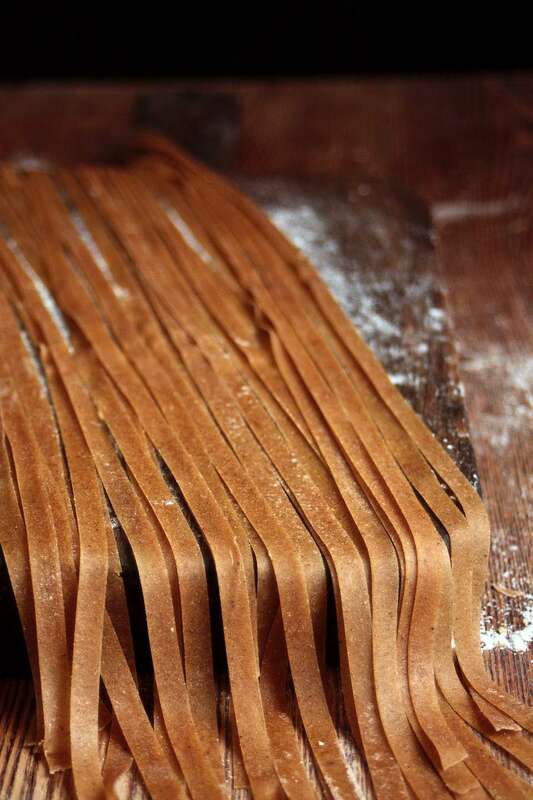 Then cut the sheet into irregular pieces using a knife or serrated pastry wheel (the word stracci means rags) or run through a pastry machine to cut into long, thin tagliatelle. Set a large pot of water to boil over high heat for the pasta. Meanwhile, melt the butter in a small pot over low heat with the sage, which will flavor it. Let the sage leaf infuse into the butter for one to two minutes, then remove the leaf and discard it. Season the melted butter to taste with salt and pepper. When the pasta water reaches a rolling boil, add one to two tablespoons of coarse sea salt to the water. When it returns to a rolling boil, add the pasta and cook for just one to two minutes (since the pasta is fresh, it will cook very quickly). Drain the pasta, return it to the pot, and toss it gently with the sage-infused butter. Serve with the grated Parmigiano on the side for those who want to use it.